You are here: Home / Thank you for your interest in writing children’s books! Thank you for your interest in writing children’s books! I look forward to helping you fulfill your writing and publishing dreams! 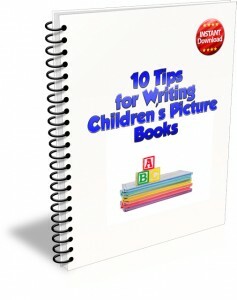 with tips and strategies for writing children’s books! Does the idea of learning the craft of writing children’s books from the comfort of your own home sound appealing to you? Then why not consider taking one of my Just Write Children’s Books home-study courses? How to revise and edit your manuscript… and more! Each week, you will receive a specific lesson in writing and editing your story, with corresponding assignments and worksheets. Within 8-14 weeks, (8 weeks for the picture book course, 14 weeks for the chapter book/middle grade or YA novel courses) you will have written a complete, submission-worthy manuscript in your genre of choice, and be on your way to submitting it to agents and publishers… all from the comfort of your own home! A comprehensive Editing Checklist against which to measure your manuscripts from this point forward, and ensure all your submissions are agent-and-publisher ready. A $50 Gift Certificate toward any of my award-winning editorial services, including manuscript evaluations, line editing and one-on-one consulting. If you’ve been trying to find the right course or mentor to help you fulfill that dream… this is the moment to make that dream come true. Have questions? You can view a list of Frequently Asked Questions here. Click here for more information or to purchase any one of the courses! 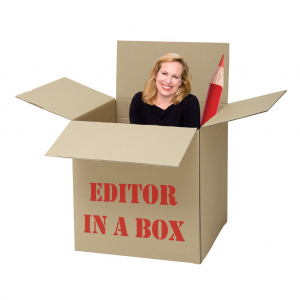 And announcing my newest resource for children’s book authors, Editor-In-A-Box! Editor in a Box comes in two versions – picture books, and chapter books and novels. Most recently, my good friend and colleague, author and 12X12 Picture Book Challenge Founder Julie Hedlund, and I officially launched our new course, The Ultimate Guide to Picture Book Submissions! A fast-track course for creating a flawless picture book submission that will land you an agent or book contract! YOU HAVE TWO SECONDS TO MAKE AN IMPRESSION with an editor or agent when you submit your picture book. Don’t squander your chance of success by making rookie mistakes or sending a ho-hum query letter! Get The Ultimate Guide to Picture Book Submissions! Now here’s that other FREE gift I promised….